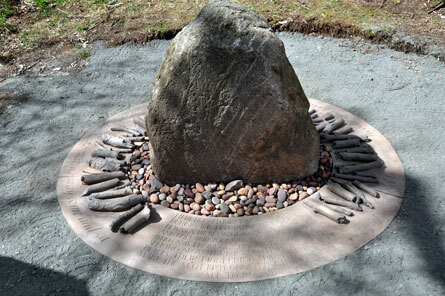 Welcome to 'The Craigallian Fire Memorial Site'. This site tells the story of an important beacon of history in the outdoors movement – the Craigallian Fire – and what it meant to many poor, out-of-work young people in the Great Depression years of the 1930s. On the present-day path of the West Highland Way, beside Craigallian Loch, two miles North of Milngavie, Glasgow and two miles West of Strathblane, the Craigallian Fire became a legend and its heat warmed the hearts and spirits of the young men and women who were drawn to it (click for map). Here was always an unspoken welcome; a mug of tea; stories of 'derring-do' and adventures in the wilderness of Scotland; and a wealth of knowledge to be passed on to the 'tenderfoot'. The Fire was a beacon of hope and many of those who sat round its flames were an inspiration to the upcoming generation of walkers and climbers. By its flickering light were born famous mountaineering clubs like the Creagh Dhu, Lomond and Ptarmigan clubs. Some Fire-sitters became pioneers in the movement to open up Scotland's wild places to all people. Few of we present-day walkers, climbers, cyclists and canoeists realise the debt we owe to so many of these Fire-sitters so, with the kind permission of the landowner Duncan MacFarlane, we have commemorated their legacy by erecting a memorial on the site of the Fire. This was formally opened on the 15th September 2012. You can see more about the memorial project here. You can also see many anecdotes from people like Jock Nimlin, Tom Weir, Chris Lyons, Bob Grieve and many others in Fire Stories. We're still trying to collect any anecdotal material relating to the Fire so that we can produce as comprehensive a record as we can before it's lost to us all. If you have any photographs, stories, anecdotes, names of Fire-sitters or whatever - please contact us. Your help to preserve these memories for future generations will be greatly valued.